Humans can be very strange creatures. Strange because we seek “the latest news” but are in practice seeking nothing more than the emotional-intellectual comfort that comes with the confirmation of our beliefs. We all “know” things, the news just confirms to us that our convictions are actually “right” or even that they are “the truth”. We humans seem to be avid consumers of a sort of passion play where the characters represented fit their roles and repeat them endlessly. We are drawn to the sources we know are going to give us answers that fit our worldview, our way of thinking, and we generally aren’t questioning their content, much less their framing of it. This desire to fulfil this need is particularly true when we are faced with events that we have little knowledge about – events that are so far from us physically and mentally that we run to our comfort zone to explain to us how we should feel about said events. The problem is compounded as we turn to these sources again and again, sources which tell us that they are keeping us informed, lulling us into the idea that we know and are aware, when in fact we do not know and we are not aware. This creates the problem of cognitive dissonance, which is the illusion of believing that we know something when in fact we do not have the knowledge or information to process events unfamiliar to us. So, how do we think? We often tend to think categorically. It is the way that verbal communication is taught at a primary level, so it lasts a lifetime. We all know how much time and effort can be saved once you divide the world into convenient categories of good/bad, black/white, us/them, etc. Therefore, the news source or information that one seeks already fits neatly into this paradigm, and in addition, it is one that more often than not is culturally familiar. This is not to say that there is no truth to some binary thinking. Unadulterated extremes indeed do exist, and at times we are even aware of what they are because the parameters to judge them are clear, but to attribute a value judgment to something, one has to know its true nature. One has to go beneath the surface. Subjectivity can’t be avoided because of our human nature, but it would help if we knew more facts than we think we do! Because they lie. But does that mean the “alternative” media tells the truth? No. 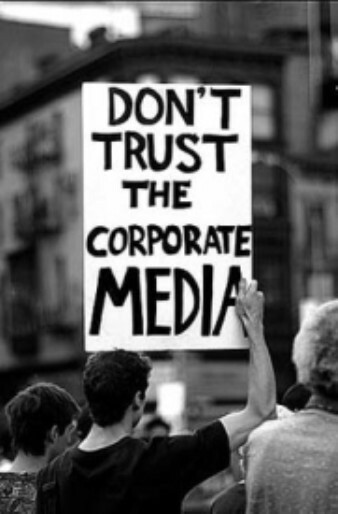 Many people will not watch TV because they are diffident about what the corporate media is telling them. It’s in fact correct and reasonable to mistrust something that tells you to buy what you don’t need with money you haven’t got and makes you feel miserable for that feeling of consumerist desire that TV implants along with its programming. Some who don’t watch TV because they are convinced it is “the idiot box” that creates conformity around falsehood at any rate have to obtain their information from someplace, and quite a few of them reject the Mainstream Media (MSM) because they attribute to it the same faults as TV, ie, that it peddles lies and that they want to “think independently” and “think out of the box”. This is why they tend to avoid newspapers or Internet sites that are connected with any corporate ownership, and most of the time that leads them to “alternative” news. Alternative news has its own pundits, its own worldview and its own pecking order of news analysis that runs the gamut from political correctness to conspiracy theory (and everything else in between). But it can be just as equally full of lies, rumour, false ideology as the corporate media. Thinking out of the box in this case isn’t happening, it’s just that the box might not be made on a production line and it looks more creative. And, as far as the alternative media goes on Syria, their box has been pretty badly distorted most of the time. In an effort to be the alternative source on Syria, many outlets have taken to making predictions and speculations out of context. These predictions and speculations based on current events in no way offer a comprehensive view of the situation, thus leaving us with definitions of the conflict ranging from “civil war” to “Jihad” or “holy war” in Syria. Furthermore, these alternative outlets often ignore the context in which the Syrian revolution is occurring – including both historical context and regional context. Finally, the gravest error may be that many of them then turn to an extremist explanation on either end of the spectrum, some exaggerating to the point of lying to get the attention of the MSM. Sites that we came to know and trust for their coverage of the invasion of Iraq have for the most part, and with the stellar exception of Uruknet, been repeating as if by rote the same rhetoric (then, we didn’t call it rhetoric, because it made perfect sense with the objective facts on the ground) they used for making the public reject any intervention in Iraq, but this time they are transferring it to Syria. Virtually ignoring the fact that the situation is entirely different in almost every essential way, they dust out the anti-war slogans. The only problem is, they are not so much anti-war as they against THIS war, more specifically, against any kind of opposition to Assad, and therefore, they are anti-revolution. Reactionaries and counter-revolutionaries: being labelled by those words should chill their spines, but the consumers of these sites instead insist upon remaining virginal in their “defiance” and they repeat blatant lies such as that of there being no revolution in Syria, just a Western-based plan for take-over of Syria. They used to say that seeing is believing, that you should always suspend your belief until you had evidence, and the best kind was physical evidence, visual proof. In the case of the Syrian revolution, first “they” (the counter-revolutionaries who read the alternative media a-critically) said, “we need proof” (that there is unhappiness in Syria). So they saw protests. Dozens of protests just like in all the other countries in the region were having and largely for the same reasons. But this was not to be trusted. Syria, in the collective imagination of the alternative media progressive had always been “a good guy” for the mere virtue that “the West” had it on a rogue list. Now, rogue lists are ridiculous at best, especially if those paying the price are not the leaders of those nations, and if the compiler of the list has invaded nations in a serial way, but paying the price are the people who face restrictions because they are citizens of those nations, so it is criminal at worst. But to turn Syria into an “anti-Imperialist paradise” also would require evidence to demonstrate such a claim… which has not been forthcoming. Yet… there was no believing the videos making their way out, they were just not taken into consideration, no matter that there were hundreds of thousands of them and they certainly could not continue to be labelled as creations of a film studio in Doha as many “anti-Imperialist pundits” were saying, taking the cue from the regime prompts. But, the fact that there had been even less protests over the decades than places like Egypt, Tunisia and Lebanon actually can serve to give an idea of how bad things really were in Syria before the revolution. There was a prohibition of providing evidence of the massacres, torture chambers, arbitrary detention and massive limitations on human rights. The truth and facts about life in Syria under Assad were kept well under wraps. That was because for a Syrian to even speak about all of this, inside Syria meant disappearance, torture or death and outside Syria meant the possibility of never returning home, even for a visit. It was one of those situations of “you wash the dirty laundry in the home” on a monumental scale. It is really not the fault of the consumers of alternative media if they believed the lies, all of us who rejected the “rogue state” way of thinking did that. But we weren’t entirely to blame, we didn’t have that much chance of knowing any differently. We’ve all signed petitions for the release of bloggers, but the actual EXTENT of the silencing of internal dissent was not fully understood. There was no way to understand it. The regime was so repressive that this information could NOT get out “unpunished”. Then, things changed. It took the courageous actions of children to wake up what had been 40 years of slumber induced by severe repression and humiliation at the hands of the Assad family. People found their courage and voices and started to take to the streets in Syria, bloggers who alluded to things and kept their criticisms to complaints about the lack of liberation of occupied Golan, were taking pictures, filming events, showing visual evidence of what they had with great difficulty gotten out there “before”. Then, it wasn’t just bloggers anymore. Anyone who happened to have a cell phone was filming what was happening in every part of Syria, in a constantly growing way, and evidence of the oppression, the repression and the revolution were available free of charge and without any kind of filter, be it the MSM or the Alternative media. The Syrian version of The Dear Leader, one must presume. 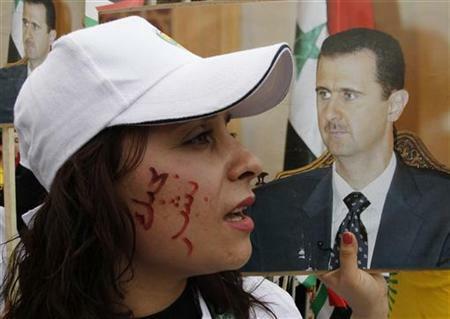 A supporter of Syrian President Bashar al-Assad carrying his image, with words written on her face that reads in Arabic ”Bashar I love you”, takes part in a rally to commemorate the 65th anniversary of the foundation of the Baath Party, at al-Sabaa Bahrat square in Damascus April 7, 2012. Yet, the true problem is not only that they see and they refuse to believe, but they have come up with reasons for why Assad has to be “backed”. They insist that the revolution is fake, (as if they know a real one!) and that it’s simply masses (millions!) who are blindly saying the slogans that their “prompters” in (take your pick) Saudi Arabia, Qatar, the NATO, the United States, (as if they are interchangeable and have the same agendas!) have prepared for them. They forget the adage that is a truism for activism regarding Palestine/Iraq/Afghanistan: if one is armed with a just cause, there is no need to lie, or even to exaggerate. The facts of things alone, the evidence of misery, of oppression, of suffering and struggle are sufficient and require no justification, just a moral compass that is still working. The problem that was pointed out at the beginning of this essay is that language and culture are the crux of understanding the problem and getting to the bottom of the truth, and then acting in a consistent and morally viable way. The average person reading this will have English as his or her first language, will live in a Western country and will be familiar with the rhetoric of the dominant culture. That means that the person reading this will already know that calling one a terrorist is condemning his cause and considering its perpetrator anathema. We are all fully aware that some political parties are systematically labelled and blacklisted by the USA and Israel as “terrorist organisations”, despite the fact that they have even been victorious in elections in Palestine that were deemed legitimate by the overseeing bodies of the UN. We have rejected those labels because our “moral compass” understood that they were created in a climate of oppression, were aimed at liberating occupied lands and they restrict their operations to military ones. We activists consider them as freedom fighters and there is no need to defend them or their purposes, though we are still entitled to critically appraise their actions as serving the ends of the cause or falling into political party dormancy. Likewise, it is easy to refer to the party that uses a car bomb in a city as a terrorist, and even to accept the (later almost always debunked) Syrian regime’s claims that it is work of the opposition (when they are being nice they call them rebels, but most of the time they are translated in even the most liberal-radical news sources as “terrorists”, when they don’t call them “rats”.) Yet, it is the armed opposition, the Free Syrian Army and then the constellation of armed forces alone who are called terrorists when they are defending a liberated town, or what remains of it after the shelling and armoured tanks finally roll back out to fill themselves with more lethal shells. Why are the alternative left and anti-imperialists information sources not referring to air strikes over Aleppo and other towns and cities as terrorism? Why do they seem to ignore bodies of women, children and men of all ages with their throats slit and their hands tied when it is clear beyond all doubt that the perpetrators of these acts (crimes) are either the “regular” army or the armed thugs known as “Shabbiha”? Does the blood of these victims cry less vendetta because the hand holding the knife works for the “president”? Misunderstanding of these words is one of the major errors of the pundits and the media. Resistance is not a new concept in the Middle East. The region has had its share of both external and internal leadership imposed on the masses. Syria is no exception. In 1920, the French colonised the country of Syria and remained there until 1946, when Syria regained its full independence. In the first battle for independence in 1925, Sunnis, Druze and Christians coordinated to oppose French rule and mistreatment of segments of the population. While the revolt was eventually put down, it is often remembered with fondness for the ideals it stood for, and it paved the way for the battle for full independence. In between independence from France and the Assad family rule, there were several coups in Syria. In 1970, a new family came to power – the Assad family. This family was to spend over 40 years controlling the lives of Syrians – their social gatherings, their speech, their religiosity, their mode of dress and their economy. The old lessons of resistance from the days of French rule had been taken to the grave but were suddenly recalled by the Syrian people when the regime arrested and tortured school boys for writing, “The people want the fall of the regime,” on their school’s wall in March 2010. Syrians in the Dar’aa Province mobilised in peaceful protests, often calling for “freedom,” “isqat annithaam” (the fall of the regime), justice, and an end to corruption. Other provinces began to follow suit, mobilising in mass protests when regime forces responded to the peaceful uprising in Dar’aa with bullets, arrests and eventually shells. Thousands of these demonstrations, all peaceful, are documented by hours and hours of video footage on YouTube. Two years after the uprising, the footage continues to uploaded by activists on a daily basis, with most demonstrations mobilising on Fridays. Of course, because most of the signs and chants are in English, this often makes non-Arabic speakers weary, particularly if they hear the demonstrators chant the words made famous by Major Nidal Malik Hasan, the U.S. Army psychologist accused of killing 13 people in an attack on Fort Hood. These two words are Allahu Akbar – literally translated as “God is Most Great.” While Major Hasan is accused of shouting these words during the attack, many non-Arabic speakers do not realise that this phrase is actually very multi-dimensional and, more importantly, a phrase that has been in existence for thousands of years before Major Hasan came into the picture. 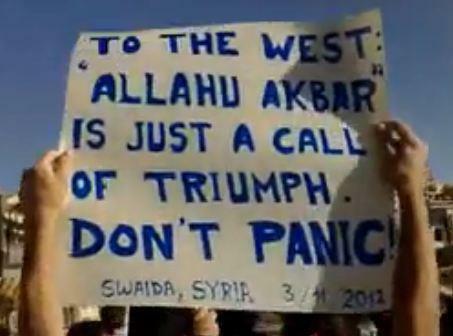 In the Syrian demonstrations, when Allahu Akbar is chanted, it can range from signifying that the protestors feel that God is the Most Almighty to serving as a prayer for help from God. The phrase is often very contextual – for example, in the videos where the Assad regime has perpetrated some sort of attack on civilians, the phrase signifies a plea to God – that God is greater than all of the evil happening in Syria. In demonstrations supporting freedom and justice, the phrase will often signify triumph and a vow to persevere, with God’s power, in the struggle for freedom. Yet many, from seasoned journalists to “instant book pundits” have defined this phrase as the battle cry of the “religious war” and thus have painted the entire revolution with the same brush, lacking even the most basic understanding of what is going on or what protestors mean when they use the phrase. Furthermore, they ignore the rest of the innovative words being written, created and chanted by the Syrian people and focus on this one phrase, yet another example of refusing to come to an understanding based on facts and knowledge rather than personal comfort and preconceptions. Understanding the culture and language of “the other” is always a prerequisite for legibility of their message, in any media/medium. But if you don’t know the language, roll with the emotion and understand where the players are coming from. We are so embedded in our own cultures, that we fail to realise that we are unable to decipher what we think is obvious. An example comes to mind of a classic film. Fellini’s “8 ½” is about a filmmaker going through a terrible creativity block. He moves from scene to scene attempting to overcome it. Fellini is a poet, Marcello Mastroianni is an artist, both of them able to break through the language barrier and communicate this situation and the sentiments involved. In fact, this film is loved by many people who don’t know any Italian. However, it is a product of its culture and language and only an Italian speaker would truly understand the final, moving and amusing scene, where everyone in the film magically appears and partly under direction and partly spontaneously, simply start to go in a massive “ring around the Rosie”, eventually involving the director who up to that moment couldn’t figure out how to get back to his work. It is five or so minutes of circus music and movement. To an Italian, what everyone is doing is encouraging him to “girare” (go around in a circle), which is the Italian word for “filming”. The metaphor and its poetry and beauty doesn’t need to be explained to an Italian, but it would escape others, who see the beauty but don’t quite understand it because it is outside of their cultural reference. So, what is this example saying? That we can’t know all the cultural cues that come to us by the messages (verbal, visual and so on) during the Syrian revolution unless we are Syrians or have a deep and correct exposure to them, far removed from our OWN filters. We have to be careful, if we can’t be knowledgeable, and in all cases, we have to be SENSITIVE. 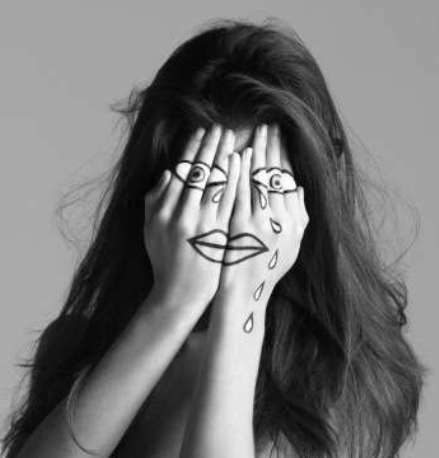 We can see and on a human level sympathise with the human suffering in Syria right now. Ignoring it or replacing it with the wrong frame or with our own frame is never going to be of service of truth and justice, and isn’t that what we are into activism for in the first place? 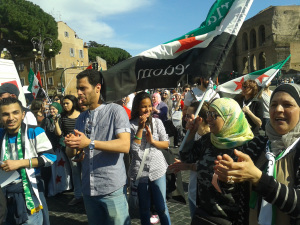 Hundreds of Syrians and supporters of the Syrian cause took to the streets of Rome on 13 April to say “We’ve had enough of the massacre perpetrated by the Assad regime in front of the indifference of the world”. They came in coaches, trains and cars; the young and the old, women, children, entire families who live in various cities of Italy, who in Syria have families and loved ones living in the cities under siege. Answering the appeal of the organisers were coaches full of people from Verona to Naples: it was a presence that was important for the reasons of the march more so than for the numbers of people. 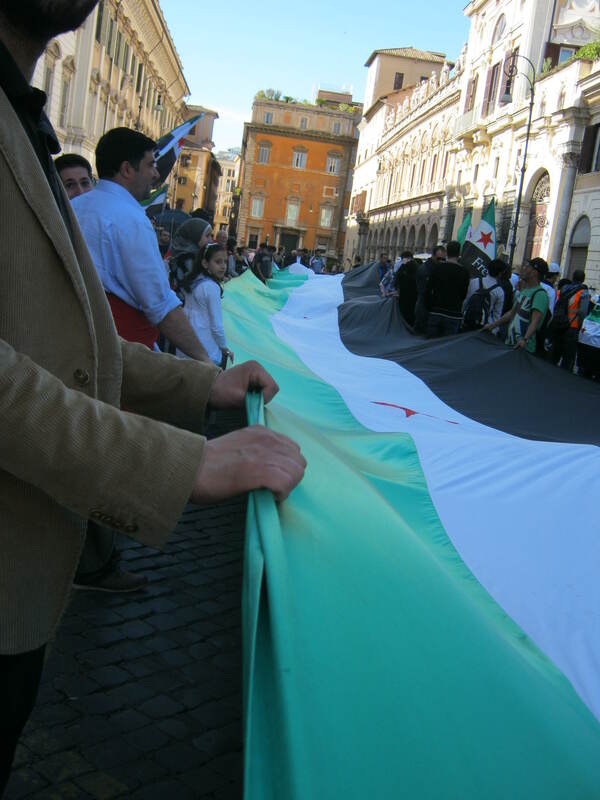 The vision for those in Piazza dell’Esquilino where the march started, was an impressive one: a Syrian flag measuring 60 metres opened the march, followed by an orderly and proud stream of people who, despite the fatigue and stress of over two years of protests and activism to fight the repression their loved ones are subject to, has never betrayed its pacific nature or its ideals. 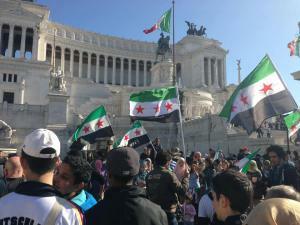 The threats and the intimidating acts coming from the supporters of the Syrian dictator in Italy that had preceded this march did not dissuade anyone. The cherrybomb that they exploded in a parallel street to the square where the marchers gathered served no purpose. It was just a loud bang that had caused the law enforcement officers to intervene immediately, but it did not shake those present, in deep empathy with their people who every day must deal with showers of real bombs. Nor did the presence of the militants of the extreme right movement of Casa Pound, above street level and armed with stones and regime flags serve any purpose. In fact, they folded up their flags and broke up their own gathering when the officers neared them for identification. In their presence, the protesters chanted an impassioned “Assassins, assassins, keep your hands off of our children”. The march wound its way through the central streets of the capital, where hundreds of tourists and Romans applauded and were united to show their human solidarity. 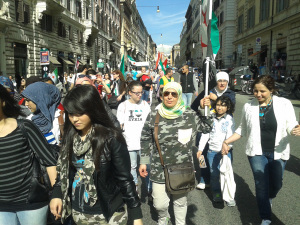 Breaking the wall of silence that engulfs Syria, indeed, is one of the priorities of activism outside Syria, and the reason for which this latest protest by the Syrian community in Italy had been called. Among the participating associations were: CNS Italia, Onsur, Ossmei, Associazione 3 febbraio, Assopace SessaAurunca and others.